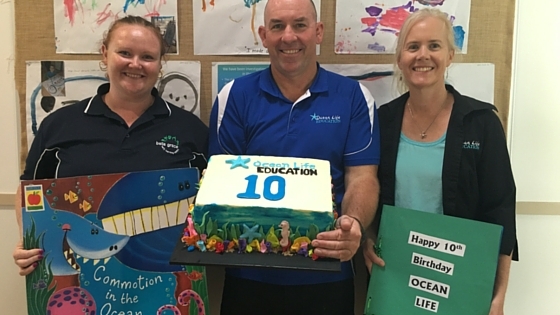 Ocean Life Education celebrates 10th birthday! It’s our birthday! We’re celebrating 10 years of educating and inspiring kids to love and protect the ocean and all of its creatures that depend on it. As a small family-run business, this is a huge milestone for us and we want to thank all of you for sharing our passion to educate children to care of the environment and inviting us into your centres and schools. This week, we celebrated with the staff at Bella Grace Early Learning Centre in Beerwah. 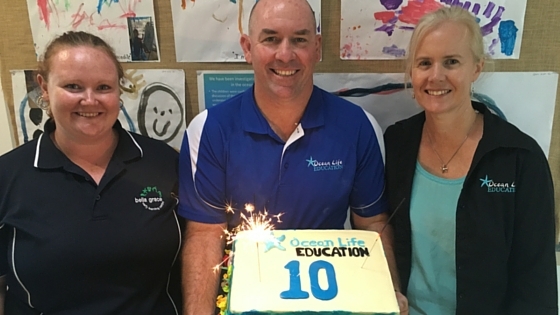 Kristy Griffiths and her team shared a birthday cake with us and presented Tracey and Richard with an amazing card from all the kids at Bella Grace Beerwah. We love it! 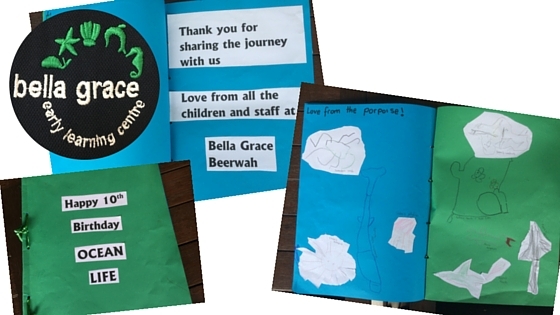 The Bella Grace centres were one of the first on the Sunshine Coast to take up the Ocean Life Discovery program when we started in 2006 and have invited us back every year since – so it was nice to share this milestone with them. Tracey and Richard Coward started Ocean Life Education in 2006 on the Sunshine Coast after realising there was a lack of environmental education from a young age. At the time, they had three children under five so they knew about the entertainment programs that were provided at child care centres but believed that sustainability could be better incorporated into children’s education. Richard was a marine ecologist and had been working at Underwater World and participating in research programs and whale rescues. Tracey was a registered nurse and midwife and had just completed an MBA at university. As passionate divers and ocean enthusiasts, Tracey and Richard knew their skills were complimentary and believed they could have a positive impact on children’s education. The rest is history. With a strong focus on pollution and how humans affect the environment, our programs offer an exciting learning experience that leaves children with a greater sense of ownership and understanding for protecting our natural marine environment. Richard says Ocean Life Education is an effective educational resource for schools, early learning centres, vacation care and events. After 10 fun years, Ocean Life Education has established itself as a leader of children’s marine education programs by bringing live creatures from the ocean into schools and early learning centres. We’ve been featured on Channel 10’s Totally Wild children’s program several times and most recently won the Sunshine Coast Business Award for Education & Training in 2015. 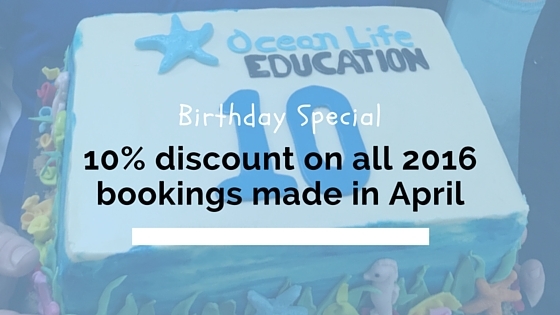 To celebrate our 10 year birthday, we’re offering a 10% discount on all new 2016 bookings during the month of April! Simply mention this offer when booking. We can’t wait to bring the sea to you! This entry was posted in Media on March 22, 2016 by oceanlifeeducation.